Are you seeking to acquire a new digital banking solution to fully digitalize your business, not just existing services through new channels? But is it a challenge to select a digital banking platform that aligns with your bank’s priorities — from a strategic, organizational, and technological perspective? 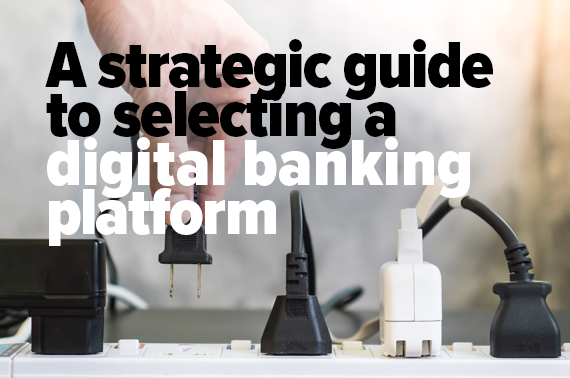 In this blog, we explain which steps are crucial in the selection process to ensure the digital banking platform of your choice meets your strategy and offers the capabilities to connect the right people, systems, and data. Selecting the right digital banking platform is a three-step process; long list, short list, and the decision itself. Involve people from different departments in each step. Why? Because the best platform from a business perspective is not necessarily the best solution for IT, compliance or operations. By involving internal stakeholders in the process, you ensure the final choice is in line with all business aspects. Even though many of you already know this, we still want to address the following as it’s essential for the success of your journey. Before starting with the selection process it’s crucial to take commonly known steps like developing a strategic plan and determining your requirements and goals. Where do you want to go as a bank? If this isn’t clear, there i s no point to start selecting a digital banking platform as you can’t guarantee the platform meets your long-term strategy. The first step is determining a long list of digital banking platforms or digital banking platform vendors. Limit this list to eight to keep it manageable for yourself. Use your network and consultancy partners to find platforms that meet your project requirements and business goals. Once you have your list with potential vendors, start gathering the necessary information in two ways: desk research and requests for information (RFI). Focus solely on the functionality of the platforms. It is all about collecting information to learn what is available on the market, to what extent the solutions fit your requirements, and to down-select non-relevant vendors and solutions. Obviously, the goal of the selection process is finding a digital banking platform that meets your banking strategy for the long-term; you want to ensure viability. The following features are essential for a future-proof digital banking platform. Take them into account when doing your research. Does it include a three-layer architecture that focuses on all three layers of the core banking platform — front-end, mid-end and back-end? And separates the platform client and product data? Does it have the possibility to integrate the platform with legacy systems? Does it support open unified multichannel integration? Does it offer a broad range of capabilities to enable seamless customer experience? Based on the information you have gathered with desk research, querying your network, and the requests for information, you define your short list with a maximum of three vendors. This phase of the selection process is not only about writing requests for proposal. To ensure selecting a platform that is a 100% match with your strategy and business, it is essential to go beyond technology and functionality. Get to know the vendors: what are their core values, who are part of their team, can they help you with your challenges — now and in the future? This approach is important because the road to becoming a digital bank is bumpy and it takes a lot of hard work. You have to cooperate with your vendor to reach your goals, so it is imperative to be on good terms. Cultural fit: What is their mission, their vision, and way of working? References: Visit the vendors’ clients, ask them about their journey, experiences, and why the platform ensures their viability. The team: Having chemistry is crucial, meet the team and the people you might be working with for a long time to come. Technology: Being future-proof is vital in digital banking, so is the platform based on modern technology? Track-record: Select a vendor that has an innovative character and exists long enough to know what is going on in the market and what you need to transform successfully. An ecosystem of third-party services: Can you connect with a fintech ecosystem to leverage innovations and expand into new markets? Arrange a workshop: Ask each vendor to present their product in a demonstration workshop. Demand a proof of concept: Make sure you can see their product in action. Cost price transparency: Can a vendor deliver transparency of the pricing model, long term and short term? The final step is making the decision based on your research into the functionality and characteristics of the solutions and their vendors. Compare this to your long-term strategic plan and requirements and you know which digital banking platform best suits your business. Taking this approach ensures that you avoid injecting massive investments in time, resources and capital into digital banking platform selection efforts without eventually meeting your business goals. I hope this blog helps you to take the first steps in the right direction to select the most suitable digital banking platform for your business. Looking for a more in-depth look in the selection process? Read this strategic guide. It doesn’t just include a more detailed explanation of the outlined steps. To give you a tip of the veil: it also includes tips and best practices to define the project scope and what to do in the implementation phase. Don’t miss out on your chance to select a digital banking platform that ensures viability and meets your long-term strategy.